Bait Rigs® Tackle Co. of Madison WI, introduces the exciting new Slo-Poke Wide-Gap Panfish Jig, designed for superior hook sets using live bait or plastics. The original Slow-Fall Jig, the Slo-Poke Wide-Gap Panfish Jig is the newest member of the popular Slo-Poke family. Weighing in at 3/64oz, it’s the perfect in-between size jig; featuring a larger wide-gap #4 Mustad hook that produces solid hook sets on Slab Crappies, hard mouthed jumbo Perch and other large Panfish. The Slo-Poke Wide-Gap also makes an excellent finesse jig, for smaller presentations to Walleye and Smallmouth Bass. The Slo-Poke Wide-Gap Panfish Jig can be rigged with larger offerings of live bait and plastics than traditional panfish jigs. It’s the perfect jig for the 1” to 2” PowerBait and Gulp series baits, that tend to over-power traditional small hook panfish jigs. The Slo-Poke Wide-Gap Panfish Jig has a weight centered body that falls slowly and horizontally, not head first, making it the perfect slow-fall swim jig that is skinny in the weeds and stays in the strike zone longer. This phenomenon also produces a more natural swimming action, making it easier for fish to inhale the bait. 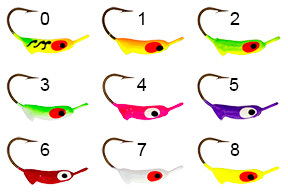 The Slo-Poke Wide-Gap Panfish Jig is available in 3/64oz in (9) colors, including Glow-in-the-dark 2-tones, that glow in “color” for periods up to 3 hours on a single charge. Odd’ball FinSpin Jig, an exciting new, high performance spinner jig. Copyright © 2019 eBait.com. All rights reserved.